The 10 Best Spa Hotels in Wisconsin! Finding an exceptional hotel is difficult, but finding a great hotel with a top-notch spa experience is even more difficult. Not in Wisconsin. Sit back and relax as these hotel and spas wow you with their comforting ambiance. Here are the 10 best in the state! Sundara Inn & Spa was ranked a top spa destination in the U.S. Energize your soul in the beautiful woods of Wisconsin Dells. Spa treatments include massages, manicures, pedicures, facials, body treatments, and more. Get away for the weekend and stay at one of their suites or villas. Indulge yourself at WELL Spa + Salon located at the Grand Geneva Resort and Spa. Packages include specials like facials, massage, manicure, pedicure, make up services and more. Choose between suites or hotel rooms at the Grand Geneva Resort while you relax at WELL Spa + Salon. Located next to the American Club, Kohler Waters Spa is your destination for a five-star spa. Try their therapeutic water treatments, body treatment, and facials. Their warm relaxation pool and soothing spa lounge area will make you feel at home. Reserve a room at the American Club for an entire weekend of relaxation. Schedule a perfect weekend in Milwaukee starting with reservations at the Pfister Hotel. The sophisticated elegance of this historic will leave you in awe. Head over to the WELL Spa and Salon. All treatments are personalized and customized for your liking. Each room is equipped with your own private bathroom and shower. You’ll truly feel like royalty at the Pfister Hotel. Located within the gorgeous Heidel House—Evensong Spa is the place to be. Evensong is a full-service spa resort in Green Lake. These rejuvenating body treatments are designed to promote wellness. Renew your body and spirit with select treatments and seasonal packages. Stay in one of the Heidel House’s guest rooms for the ultimate wellness weekend. Located on scenic Lake Mendota, the Edgewater Hotel is among one the finest in Madison. Stay play, dine, and relax at the Edgewater. The Edgewater Spa is equipped with talented hair and make up stylists, manicure and pedicure artists, massage therapists, and skin care. Escape the hustle and bustle of the city and find peace at the Edgewater. Osthoff Lake Resort located in Elkhart Lake offers guest suites for rent along with a stop notch spa. 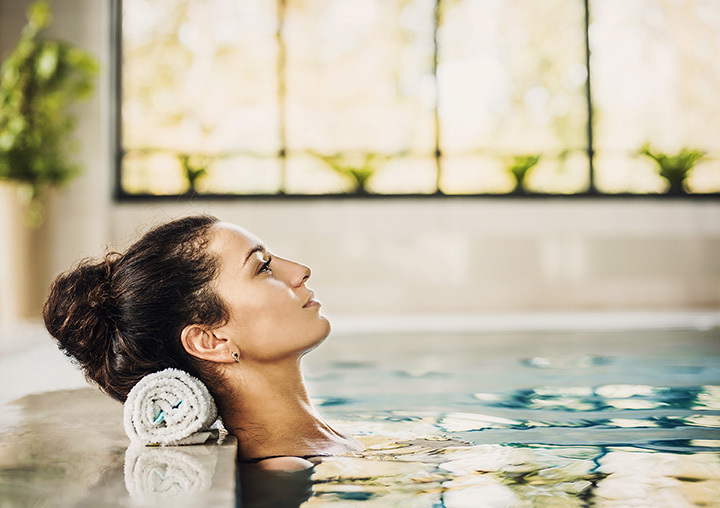 Aspira Spa has been voted among the “Top 100 Spas in America.” Their menu includes massages, facials, salon and nail services, specialty treatments, and more. Rhapsody Spa is located in the Grand Delton Resort. Indulge in Rhapsody’s Spa packages including Swedish massage, herbal wrap, foot reflexology, signature pedicure, foot scrubs, and more. Stay at the Grand Delton Resort for a couple’s getaway or friends’ weekend. Lavender Spa is located within the quaint Settlement Courtyard Inn. Lavender Spa was voted the #1 Boutique Spa in Milwaukee. Come see what all the fuss is about by booking a room and checking out their spa packages. Try their Refresher Massage—a one hour Swedish intuitive massage. Chula Vista is one of the top resorts in the famous Wisconsin Dells. Send the kids to the water park while you relax away the day at the Spa del Sol. They offer a variety of luxurious body and facial treatments. Choose between manicures and pedicures as well as relaxing massages. Their year-round outdoor Hot Springs attracts many spa goers throughout the year.